On Saturday 16th December, a true Christmas story came to life in the city of Birmingham at St Phillips Cathedral. 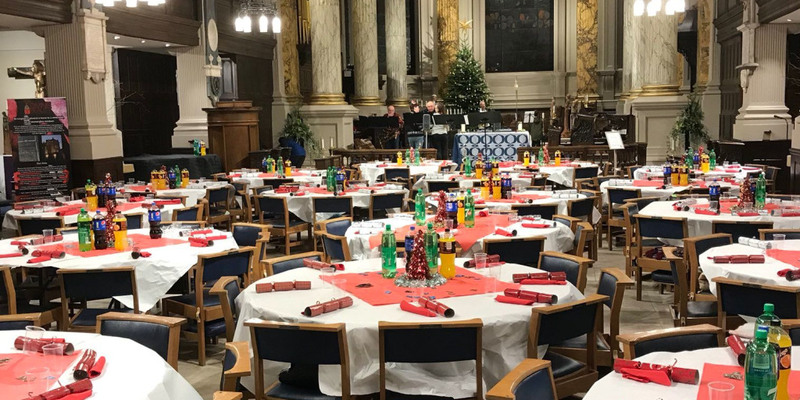 Let’s Feed Brum came together with Love Brum and Serve Our Brummies to organise a night filled with true Christmas spirit for those living on our streets. The turkeys were ordered, the kitchens were prepared, while the cooks planned a delicious feast and all of the wonderful volunteers got ready to spread some festive joy. The grand architecture at the heart of the city was all ready for the celebrations to begin, for those who need it the most this winter. And what a brilliant day it was! 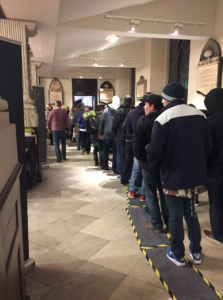 We had over 90 fantastic volunteers arrive to give out hot meals and essential supplies, all with a friendly face. 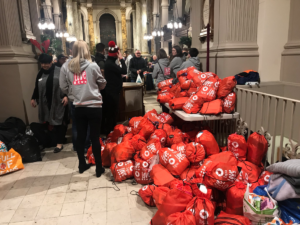 Then, 200 gifts arrived in bright red bags from Love Brum, filled with supplies and presents for those who will wake up on Christmas Day to nothing. A generous donation, filled many faces with tears of gratefulness. With queues of over 250 guests, everyone was welcomed in with a warm smile and seated at their tables. A room filled with tables, set with red table cloths, decorated with gold & silver Christmas crackers, not looking out of place in their grand setting. The doors were opened, guests were seated and the band began to play. A big thank you to the Saxophonics and Singing D who provided the whole Cathedral with their musical talents, creating a tranquil and festive setting during the evening. The warm heart of the city welcomed everyone in, from all areas of life. All coming together for one simple reason, to spread love, laughter and joy. The delicious hot meals were provided from St. Vincent De Paul Society, Mount Carmel Redditch, The Nailers Arms Bromsgrove and Holy Trinity School, Small Heath. 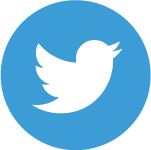 A massive thank you for getting involved and providing the staff, premises and equipment that was much needed, in making the day a success. The Christmas spirit could not be missed, with the joy of human fellowship, hugs and smiles, of good food and great company. There was laughter and tears of joy, some danced to the music, all fed on the spirit of compassion that filled the Cathedral and not one person left unmoved by the magical night that took place. There was unbelievable support from all of the volunteers, the Cathedral staff, the Dean, and members of the congregation as well as the Bishop Robert Byrne attending. Most of all we were overwhelmed by the kindness spread to those who need it most during these difficult times. 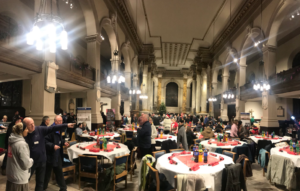 A massive thank you to everyone who was involved in the Let’s Feed Brum Christmas dinner and to those who attended, we could not have done it without you. Let’s not forget to smile and be kind over the festive period. Don’t forget you can donate warm clothes, sleeping bags or essential supplies, you can drop any donations to Itihaas Restaurant on Fleet Street, Birmingham, B3 1JL. 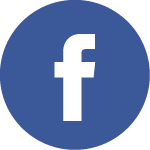 To find out how you can get involved, visit www.letsfeedbrum.com, and don’t forget to follow the group on Facebook, Twitter and Instagram using @letsfeedbrum. * A big thanks to everyone who tagged us in photographs from the night, we have featured a few of them in our blog post!